Church is hard. What did you expect when you redeem a people from every tribe and tongue and age and slam them together into one building, one body, one family? It's hard because people are hard, and that's what the Church is. This has been true at Refuge; we've had many difficulties. We've had adulteries and we've had gossip. We've had our doctrinal divisions and our spiritual valleys. "Now the full number of those who believed were of one heart and soul, and no one said that any of the things that belonged to him was his own, but they had everything in common"
The full number—together as a single organism! Why is this so hard? Because of course it's more comfortable to be with people who share your age and affinities! It's so easy that even the unregenerate and sin-enslaved world can do it; just look at every RV convention, Comic-Con, and indie rock show. People are just fine at getting together with people whom they like. In other words, people who look like their hands-down favorite person: themselves. This reticence to gather across age and affinity is a tragedy of Shakespearian proportions because it blunts one of our greatest evangelistic weapons and drowns one of our deepest joys. See, one of the most powerful witnesses to the power of the Gospel is the visible church doing things the pagans just don't do. Things like loving (and even genuinely liking) the person with whom you share almost no discernible affinity, the radically Other person. The unbelieving world just doesn't have a category for that kind of thing, except in carefully casted, impeccably written sitcoms, wherein they reveal their deep longing for Gospel-shaped community. For family. For love. For genuinely joy-saturated friendship. For men who talk to other men. For mothers. For fathers. For grandparents. The degree to which this has been a struggle has honestly been a surprise to me. I didn't think, going into pastoral ministry, that this would be a top-3 challenge. But it is. Maybe even more of a surprise is the age group that I see most consistently struggling with this temptation, which is the older generation. And I'm not alone in this; I've talked to numerous fellow pastors who have been surprised by the same trend, who have also had to make regular raids of the over-40 bunker. Now, before we get into it, some disclaimers. First, this is tough for us all. I mean, for the 20-somethings and the 70-somethings. There are under-30 bunkers as well. Second, this is not an issue every person over 40 has. Third, you're not justified by your small group demographics. Fourth, I dearly love the older saints at Refuge, and can't imagine what our flock would be like without all of the unique gifts and strengths they bring us. I am right now picturing in my mind specific older saints at Refuge for whom I am deeply thankful. Fifth and finally, I'm not subtweeting anyone, here (that's talking about a specific person without actually saying their name, for the actual over-40s in the room). 1. Burn down your small-group ghettos. 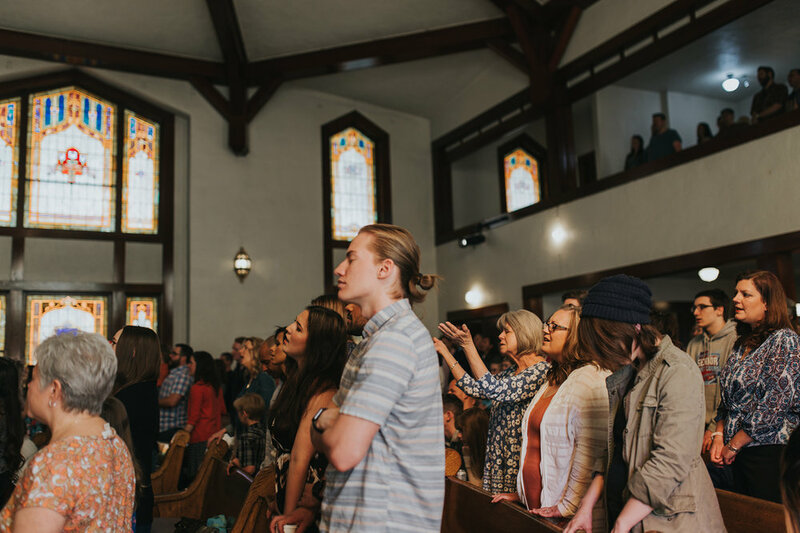 A large swath of the American Church operates on the assumption that a significant percentage of their programs should be divided up by age and affinity. This is supposed to be a way of "meeting people where they're at," or "contextualizing." This, I believe, is a bigger mistake than buying front-row tickets to a Nickelback concert. I'm convinced that this practice is more about our comfort and self-protection and, to be frank, our vanity than anything else. I've already hinted at the reasons for this above, but it would be helpful maybe to look again. Here's what I mean: Who are you prone to like more? Get along with easier? Automatically enjoy? The answer is people who look like you, think like you, agree with you, and ask little of you. In other words, people roughly your age and gender, people in a similar place in life as you, people who most identify with you culturally, people on your socioeconomic rung. What names could we give to this universal human impulse? Vanity. Pride. Laziness. At Refuge, we want to break up those age and affinity ghettos like Bernie Sanders wants to break up the banks. We want to see Gospel-grace smash the walls of separation into a trillion little pieces like Nebuchadnezzar's statue. We want to see all of your comfortable safe spaces—the places where only the people you already like are allowed in—flung open to the Other, the Unlike, the Unusual, the Uncomfortable. Seriously. Let's burn them to the ground. Let's get rid of the singles small group. Let's stick a knife through the chest of the young-marrieds house church. Let's grind down our empty-nesters fellowship and flavor our drinking water with the dust. Let's embrace the single man in his 60s; seek him out on Sunday, invite him in, pull out the welcome mat. Let's hunt down the slightly weird 17-year-old with the skinny jeans and pull up a plate for him at the table. Let's do it whether the division is in name (Welcome to the official Singles Over Sixty Ministry!) or in practice only. 2. Smash your fine china. One of the biggest barriers (*cough* idols *cough*) preventing this from happening may just be your nice stuff. How to put this delicately... Are children welcome in your house? Will you let them break your stuff and make more noise than you are comfortable with? Will you love them enough, humanize them enough, go low enough to treat them as welcomed neighbors? Cherished bearers of the divine likeness? Friends, even? No? Ok, then there is no hope for your house to join in the particular blessing I'm talking about. If you're over 40 and allergic to kids, there's not much help I can give you. See, kids are basically the perfect litmus test for neighbor love in Jesus' name. I mean, think about it: What group will give you the least back for your trouble? What group will gray the hairs of your head faster? What group is least likely to pat you on the back for your generosity? Kids! They eat all your food and forget their thank-yous. They are loud and socially ungraceful. They aren't nearly as worried as you are about the longevity of your flooring or the state of your bathroom sink. So smash your fine china. Take a hammer to your breakable trinkets. Bring out the plastic plates and feast. Get the drywall spackle ready for the holes. Dust off the toys your kids left behind when they moved out. Maybe pre-stain your carpets with some grape juice so you're not so worried about them. After all, do your carpets bear the image of God? Will your china sit next to you at the Lamb's great supper? Will your unblemished walls inherit eternity? 3. Expect nothing in return. Expect nothing in return for all of this. Nothing, that is, except joy. Except holy growth. Except fruit. Except wider sight of God's good glories. Except deeper love of the Other. Except a more biblical church. Except unexpected merriment. Except family. Except legacy. Except a bigger clan. Except new friends. Except the death of cheaper pleasures and resurrection of better from their grave. This big family we call the local church is costly and it is tiring and we shouldn't trade it for all the clean dishes in the world. And what's more? It's already ours. It's in our grasp, friends. It was bought, won, built, and given us by our great Father through his good Son. Is that worth your fine china and your quiet house?